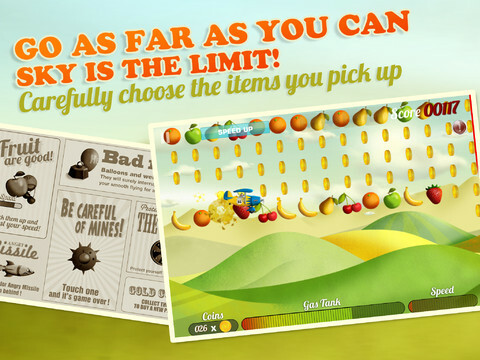 Grab pieces of floating fruit and dodge mines in Chillingo's endless flyer. Chillingo took to the skies last week with a simplistic 2D side scrolling game called Tiny Plane, which sort of reminds us of Halfbrick's Jetpack Joyride in that it's an endless runner where the goal is to fly around collecting gold coins, but instead of exploring an enclosed space, you're out in the open, where a canine pilot faces hazards that'll ground the happy pup in no time. It doesn't take long to get the hang of the controls. Pressing the left side of the screen causes the plane to ascend, while tapping the right makes it descend. The trick involves balancing the two to remain airborne, paying close attention to the on-screen fuel gauge, where landing automatically refills the aircraft. That said, landing is a bit tricky in that the slightest burst in speed crashes the plane. It can be a bit of a downer in the game's more intense moments, and we wish the developers at Pow Pow Games were more forgiving in this regard. Of course, there's more to Tiny Plane than keeping the plane soaring high above the clouds. 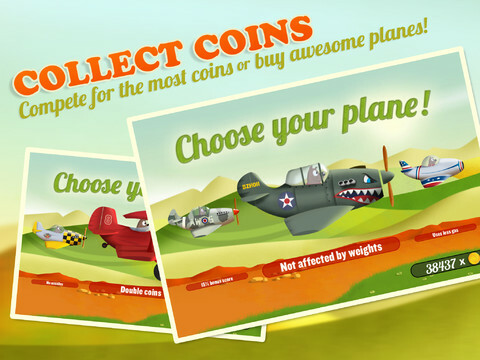 Picking up pieces of floating fruit increases the aircraft's speed, while collecting those aforementioned coins pads your virtual bank account, allowing you to buy different planes with various abilities. Also, in a refreshing twist, there is no in-app purchase, forcing you to earn those new vehicles through good old-fashioned grinding. Meanwhile, a small handful of obstructions seek to make life in the friendly skies difficult. Getting struck by lightning causes you to lose coins and speed. Weights, meanwhile, slowly drag the plane down. The worst, though, are the mines and heat-seeking missiles. Get hit by one of those, and the game ends; thankfully, red markers let you know something bad is on the way. Overall, we like Tiny Plane, as it provides that all-important "just one more try" element that helps make it addictive. Unfortunately, we struggled getting online multiplayer to work. Although the game supports two-to-four players in one race, we couldn't find a single person to compete against, which either has something to do with Tiny Plane's inability to connect people, or the simple fact that perhaps no one's interested. In addition, there's little about the scenery that grabs us. For the most part, it's the same rolling hills. On one hand, it makes spotting mines easier. On the other, we could use some variety. Taking this into account, there's still plenty to like about Chillingo's latest, and considering it's only a buck, you'll certainly get your monies worth. Review code provided by Chillingo. What's Hot: Simple and addictive play, collecting fruit to increase speed, climbing the leaderboards and unlocking new achievements. What's Not: No change in scenery, not enough power-ups, multiplayer lobby is a ghost town, too easy to crash.